There are so many important stories from World War II it’s almost impossible to keep track. Of course, there is once such story that was truly game changing. Years into the war a group of intelligent Britons, were tasked with deciphering a German Enigma machine. A task that could potentially be an important turning point in the war for the Allies. If the story of the Allies getting their hands on an Enigma machine sounds familiar it is: the 2000 submarine thriller “U-571” tells that storie of American sailors trying to get their hands on one of the devices. It was a film that was basically pure Hollywood myth – none of it really happened. “The Imitation Game” tells the real story – not so much getting the device- but Great Britain’s covert mission to break the code and help win the war. The man at the center of all this was mathematician Alan Turig (Benedict Cumberbatch) who became one of the most important people to help win the war – though no one ever knew it. This is his story. 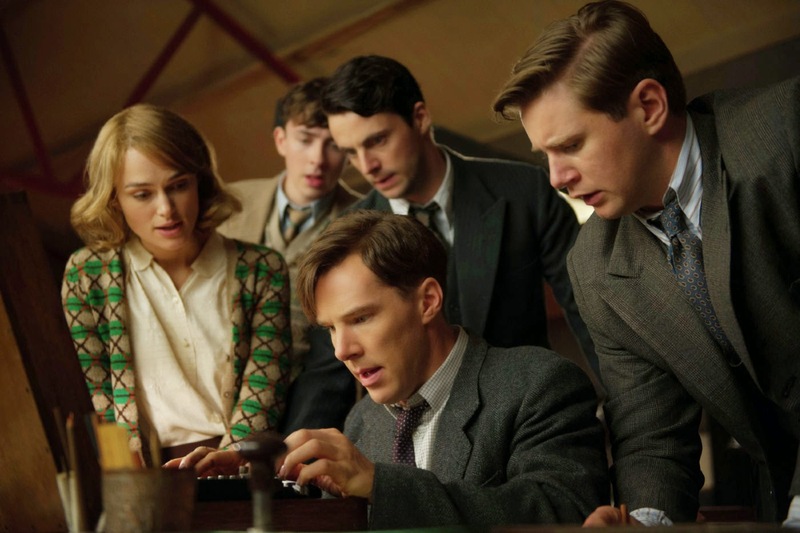 “The Imitation Game” basically tells three stories. First, is a young Alan Turig during his unhappy teen years at a boarding school and his friendship with another male student. The film’s major storyline with involves an adult Alan as he’s recruited along with a small group of other math geniuses as they attempt to break the naval code from a recovered German Enigma machine circa 1941. And the third story takes places about a decade later as horrible allegations are being thrown at Alan because he’s found out as a gay man. All three stories are interwoven almost guaranteeing editor William Goldenberg an Academy Award nomination. Even with all the crosscutting we’re never truly confused as to what time period it is. When a film is based on true events much is said about how those true events are depicted. Many have claimed the film has downplayed the fact that Alan was a gay man. It’s not downplayed, it’s just not the extreme focus of the film: this isn’t “Milk.” This is the story of an obviously lonely man (depicted here with an autistic-like social disorder which has been refuted) who’s goal was to serve his country who just so happened to be a homosexual. His friendship with fellow code breaker Joan Clarke (Keira Knightley) is the heart of the film as is probably one of the film’s highlights. The fact that the film doesn’t even reveal Alan’s sexuality until halfway through the film proves the film doesn’t want you to judge him. The film wants to show that despite whatever issues he had, and the troubling past, that he was able to overcome all that and do something terrific for his country. Morten Tyldum (I’ve never heard of him either) directs a solid feature though I can’t say I was overwhelmed visually. He wants his film to be a thriller but “Argo” this is not and “U-571” was the action thriller version of this story. Graham Moore’s script works more like a standard biopic with an obvious important goal for the characters. And since we know the eventual outcome, most of the suspense is sort of lost. That’s ok because one of the film’s strongest elements is its characters and the actors’ wonderful performances. Cumberbatch is very strong here especially in the film’s later scenes where he’s forced to keep the secret that he had anything to do with helping the Allies win the war. The film’s goal, even if it isn’t completely historically accurate (this isn’t a documentary remember) is to bring to live an important real life story. Unfortunately, Alan is eventually persecuted for being gay and isn’t recognized as the war hero he really was. He was a genius who basically invented the computer so he could crack the German code. The things he created and accomplished are still around to this day. Trailer for The Imitation Game on TrailerAddict.